The Parker poltergeist case, detailed here at the Haunted Hovel! Case study: The Parker Poltergeist. I'm sad to say, information on this poltergeist case ishard to come by. The story starts with Jim & Susan Parker who were affected by a variety of highly unusual poltergeist phenomena. With no apparant event triggering the activity, the couple were shocked and scared to hear a loud, gruff sounding voice, together with a feeling of unease. 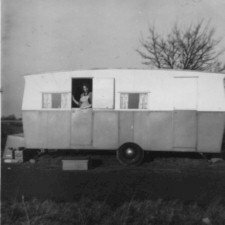 The first major incident to befall them was witnessing dirt literally being "tipped" into their caravan, where they lived at the time. Additionally a bed became inexplainably soaked with the contents of a cesspit. At the same time as this phenomena was taking place, Jim & Susan were also experiencing the "normal" poltergeist traits, such as items disappearing & reappearing, strange noises and a horrid oppressive atmosphere. Perhaps the most frightening thing to happen during this time, was the couple witnessing blood actually pouring through the joint between the wall and the ceiling in the caravan's living room. The amount of blood was estimated to be around ten gallons(!) and, following laboratory examination, was found to be pig's blood. If you would like to share any additional information, thoughts or information about this case, please get in touch with us using the contact page!